If anything, 2017 is going to have quite the steady stream of DC animated films, with the next one up being Teen Titans: The Judas Contract. Loosely adapting the classic storyline of the same name written by Marv Wolfman and illustrated by George Perez, it’ll see some of the most beloved young heroes in all of comics face their biggest challenges yet, namely Brother Blood and Deathstroke. While many of us have to wait for a home video release to enjoy the movie, those fortunate enough to attend WonderCon in Anaheim, California in a few weeks will have the opportunity to attend the world premiere. You see, on Friday, March 31 at 6:00pm, a screening will take place in the Arena of the Anaheim Convention Center, complete with panel afterwards. Should you miss out on that, an encore will be shown on Sunday, April 2 (also in the Arena), but with no panel to follow. As for who will be attending said panel, the following cast members are slated to appear: Sean Maher (Nightwing), Taissa Farmiga (Raven), Jake T. Austin (Blue Beetle), Brandon Soo Hoo (Beast Boy), Kari Wahlgren (Starfire) and Stuart Allan (Robin/Damian Wayne). In addition to them, filmmakers scheduled to partake are: director Sam Liu (Batman: The Killing Joke), supervising producer James Tucker (Batman: Bad Blood, Batman: Return of the Caped Crusaders) and character designer Phil Bourassa (Justice League Dark, Young Justice). Afterward, those listed above will be signing con exclusive mini-posters at the DC Entertainment booth. And should you have the privilege of being there, we highly advise you to stick around for all the festivities discussed, as it’s very possible insight into future DC animated movies will be given. 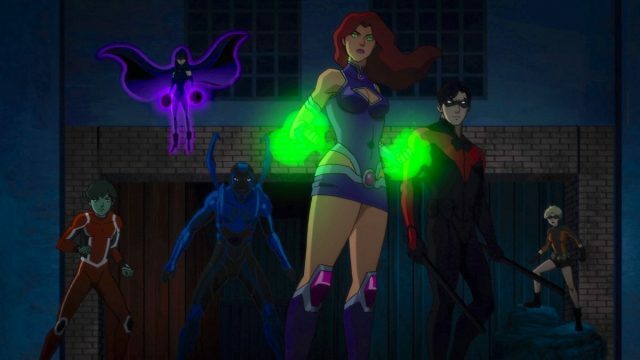 Teen Titans: The Judas Contract will be made available via Digital HD on April 4, with the Blu-ray and DVD releases following on April 18. A new image from the film can be seen below.